The LAPPL’S Eagle & Badge Foundation held it’s annual gala September 26th at the Hyatt Regency Century Plaza Hotel with over 800 guests on hand as we honored community leaders and notables --- LA City Council President Eric Garcetti; Los Angeles City Attorney Carmen “Nuch’ Trutanich; CBS Sports Director Jim Hill; Castulo de la Rocha, President of AltaMed Health Services, Acting Asst. Secretary of the Navy Harvey C. Barnum Jr., a Congressional Medal of Honor Recipient, and a special recognition of our 2009 LAPD Medal of Honor recipients. Access Hollywood’s Billy Bush was a terrific host for the evening, along with support from Event Chair/Executive Producer Arthur M. Kassel. They acknowledged and thanked this year’s sponsors which included the Los Angeles Police Protective League, Hyatt Regency Century Plaza Hotel, Herbalife, Donald T. Sterling Charitable Foundation, Steve Wallace among others. Politically Incorrect's Bill Maher was at the top of his game, and glamorous Sharon Stone helped raise funds for the Foundation as our Live Auctioneer. Honorary Chair Mayor Antonio Villaraigosa addressed the enthusiastic guests as well as Eagle & Badge Chairman Peter Repovich who thanked the committee and supporters, and Dr. Jefrrey Cummings of UCLA, Medical Advisor of the Tichi Wilkerson Kassel Parkinsons Foundation. Additional participants included former Governor Gray Davis, U.S. Congressman Dana Rohrbacher, Asst. US Attorney Nicholas Trutanaich, Dr. Stephen Mayberg, Director of the CA State Dept. of Mental Health, City Controller Wendy Greuel, and NBA Legend Jamal Wilkes, along with LAPPL’s President Paul Weber. 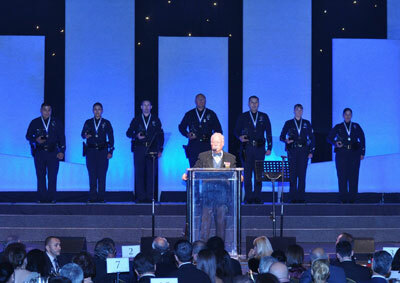 Throughout the evening, the tireless work and sacrifice that the members of the LAPD do and give to their communities was recognized by the honorees and presenters.